web site. 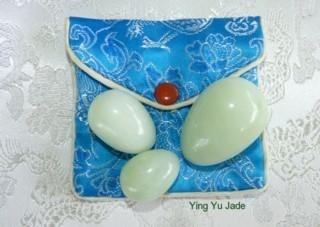 You can view the collection, read more about jade and how these tools are used, and purchase on Ying Yu Jade. Read the Jade Blogger for posting about jade and wellness. The blog will open in a new link, so be sure to bookmark Calm Spirit for easy return. Chinese jade stone gua sha tools for qi balance and scraping. Jade rollers for face and body. More information on Ying Yu Jade. Jade eggs for women kegel exercise. Jade ben wa balls also available. Watch video about why use jade and information about jade eggs. Jade pillow covers in a variety of styles. Heavy and substantial for a good night of sleep on healing jade. 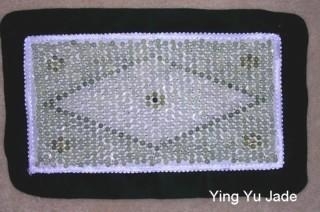 Visit YingYuJade.com for more jade health tools and information about using jade for healing..
organization, structure, inner strength. Grief is an emotion that indicates imbalance. most related to the kidney meridian, see "black jade" below. "Hong" jade, red/orange color, has energy for protection and safety, success, confidence, courage and happiness. Related to the heart meridian, balance indicates socializing, talking, being charismatic. Anxiety, restlessness, and insomnia indicate imbalance. Element is fire. related to the speen / stomach meridian and earth element. Worry, anxiety indicate imbalance. Overeating is also imbalance of the speen meridian. Honey or yellow jade helps balance. meridian. Black jade is protective, good to wear when traveling. Chinese "river jade" is natural color jade. The colors are made by the minerals in the water where the jade is mined. If you wear jade as "medicine", you can find a jade bangle with the natural colors to balance your qi meridians. This "river jade" bangle bracelet has classic green jade for the liver meridian, and is the general healing color. The charcoal or black veins are related to the kidney meridian. The brown or honey color veins are related to the spleen meridian for the yellow hues, and the heart meridian because of the red hues of the brown color. 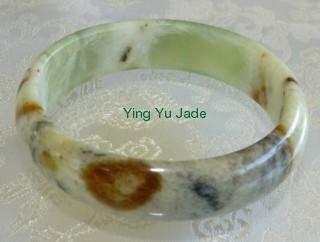 This jade bangle also includes some white color, related to the lung meridian. You can wear your jade for health and wellness, or if you don't like to wear jade bangle bracelets, jade pendants are available. And if you don't like to wear any jade, you can sleep with it to experience the qi healing of the jade. You can find jade bangle bracelets, jade pendants, and jade carvings made from this natural color Chinese river jade on the Ying Yu Jade web site.